I'm making my way back from vacation, slowly. I wanted to quickly share a new service called AppMakr that allows anyone - even me - to easily create an iPhone app - for less than $200. With just a few clicks, I created an iPhone version of my blog. The service provides a very user friendly interface to create a native iPhone application that you customize with images and content feeds. You can also monetize it by charging a fee or including ads. The service can publish your iPhone to the app store or for a higher fee you can publish with your own branding. What you get is a very simple, informational iPhone app - it doesn't give you any interactive features that might be critical to achieving your goals. However, you'd probably be paying far more than $200, perhaps even as much as $10,000 for a customized app. However, let's say you knew that your supporters/audience were iPhone users and were asking for ways to access your content on their iPhones. And, let's say you had an extremely limited budget, no design skills, and lacked iPhone programming expertise. 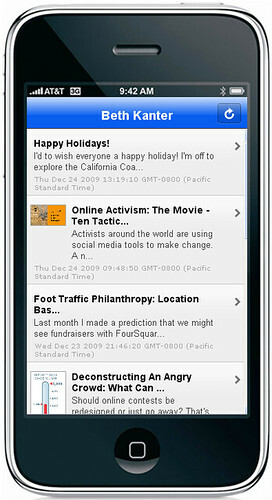 This service is an inexpensive way to get your organization's content into an native iPhone. If you want to be successful, I suggest that you spend time designing and planning your app than I did. For example, you could create multiple tabs. You'll also need to think about ways to promote it to your audience so they can find it and download it. And, of course, you'll need to figure out some metrics to measure your success. If you're contemplating setting up a low cost experiment, AppMakr is offering a big discount to readers of this blog. You can create an iPhone app for $50. Just type in KANTER in the coupon area. The discount is good from 1/4 to 1/18. Oooooh! This is *so* cool. All you have to do is right click on the icon in iTunes, copy the URL and you're all set. I <3 you, Beth Kanter (and your blog)! Thanks for always posting such relevant information. I have gleaned so much from you that's making my organization, NOEP (www.noeptexas.org), better. Can't wait to download it! Let us know when you have the link because searching isn't working just yet! Very exciting! Thanks for the tip! Will definitely check it out! One note, I think your cost estimate is a little low. Customized iPhone apps are going for $15-$25K at least. another option for wordpress users is this plugin: http://www.bravenewcode.com/wptouch/, which reformats your blog for mobile users. mobile users can see the results at http://btrandolph.com. at the botto of the page is a link to the regular version of the page. thanks Beth for scoring the discount! You might also check out iphone control panel, which allows you to configure other aspects or even redirect iphone visitors to a page or site. Remember that 2.0 was all about bringing our desktop apps online. I think that iphone native apps are a little side-step, continuing the burden of user upgrades and developer maintenance. Mobile apps should be truly mobile, able to hop from platform to platform. That said, thanks Beth for the great link. 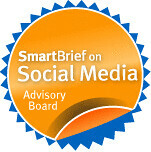 Definitely looks fun and interesting, and for the right campaign, a great tool. We're trying out MotherApp.com, which combines your blog, Twitter feed, and YouTube into one app. Also allows users to share to Facebook, Twitter and E-mail. Options are either $99/year or a 50/50 rev share of ad revenue, though they don't even have their ad network functional yet so you can choose that option for a free app.